LAE residents can be rest-assured the new Lae City Authority (LCA) will begin operations next year. That’s the word from Chief Secretary Sir Manasupe Zurenuoc, who this week clarified doubts about the LCA’s future after the O’Neill Government decided not to allocate any funding in the 2016 Budget for the authority. Sir Manasupe also pointed out that Lae MP Loujaya Kouza remained, by law, the chairperson of the authority. 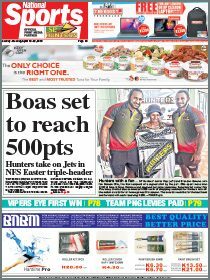 Kouza had announced last July that she was stepping down as LCA chairperson following a rift with Prime Minister Peter O’Neill’s People’s National Congress (PNC) Party. The MP claimed she had been getting “the raw end of the deal” since August last year when she relinquished the Community Development portfolio to become chairperson-in-waiting of the proposed LCA. O’Neill was adamant at the time that Kouza could not quit because the LCA legislation stipulated that the chairperson was the Member of Parliament representing the Lae Open electorate. The past 12 months has been somewhat of a rollercoaster ride for Kouza. After stepping down as a state minister, the MP reportedly went “underground” to prepare the groundwork for the new authority. During her prolonged absence, several major tragedies rocked the industrial hub at the beginning of this year which led to Morobe Governor Kelly Naru virtually standing in for Kouza at official city functions and events. The Lae MP finally reappeared after the LCA legislation was enacted in June to strenuously defend the Government against the onslaught by Naru and other Morobe leaders. She even offered the “olive branch” to Naru to put aside their differences and ensure the new authority got off to a good start. Indeed, Kouza’s long-awaited appointment had not been without controversy. She was accused of hiding in hotel rooms and not attending to her official electoral duties, including public engagements, since the beginning of the year. We said at the time that Kouza should stop hibernating and prove that she could fill the huge shoes left by her predecessor Bart Philemon. In fact, she had been handed a second chance to do so. And the chairperson wasted no time in giving her first media interview, saying the LCA intended to “hit the ground running”. Thereafter, Kouza said very little about her plans for the authority as her rift with PNC widened. The chairperson maintained that she received little or no support from PNC and accused the Prime Minister and certain ministers of pulling the LCA rug under her. 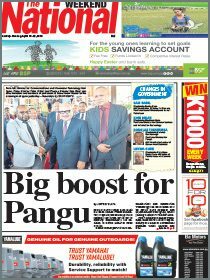 The issue came to a head during the November Budget sitting of Parliament and resulted in Kouza’s expulsion from PNC for colluding with Naru on the “Morobe Bloc” and the Opposition in their bid to oust O’Neill. The Lae MP is now a member of Opposition leader Don Polye’s Triumph Heritage Empowerment (THE) Party and her future with the LCA is uncertain. It is also uncertain whether Sir Manasupe’s “offer” to Kouza to remain chairperson is genuine or not. The chief secretary has partly answered the question about funding the LCA’s start-up operations next year. What he has not explained is the reason for the LCA not being allocated any funds in the 2016 Budget, especially after all the hype about the new authority. Nonetheless, Sir Manasupe’s latest move to get the LCA off the ground confirms the prime minister’s stand on this issue. O’Neill has always been passionate about Lae city and the LCA is his solution to the problems that have plagued the city for many years. “That is why we are creating an authority that will take ownership of delivering and management of the municipal services in the greater Lae area,” O’Neill after Parliament overwhelmingly passed the LCA Act on June 5. The prime minister has always maintained that Lae deserves better and should be given a real opportunity to develop and grow into a modern metropolis. But he insists that elected officials in Lae must stop playing politics for the city to realise its full potential. Much money and time have been put into advancing the city so far and we hope the Government will find the necessary funds, as indicated by the Chief Secretary, to get the LCA off the ground next year.